Ministry, that industrial freak of metal kind, says adios to us all with a live album. And for those who have had the opportunity to experience Ministry live, it would seem an appropriate goodbye. Ministry was by any measure an intense live experience and it is apparently as a live band Al and the boys want to exit. Do not expect a best-of album as it is often the case with live offerings. 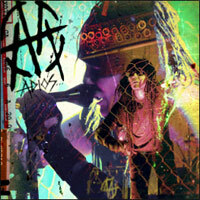 ‘Adios…’ contains only material from the last three Ministry CD’s, which could seem a bit curious. But then again: aren’t those three albums dedicated to George W? And isn’t the dawn of the new age, the age of Obama, the end of Ministry’s crusade against W and thus the end of the band itself? Perhaps it makes sense. A live recording, in my view, will never recreate the energy, anarchy and intensity of a Ministry concert. As far as live albums go, ‘Adios…’ is a fine piece. The sound is compressed and good and the band is clearly there. But it can only be a shadow of one of the big and weird phenomena of metal, only an indication, nothing more. Adios Ministry – you will be missed!